(Newser) – Days after he competed in a February wrestling tourney, Blake Flovin began exhibiting odd symptoms: He started itching, got a rash, and "the left sides of my face by my lymph nodes started to swell," the high school student tells KTVU. His father likened the 17-year-old's face to that of the "elephant man." 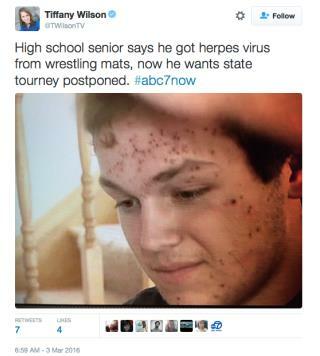 Turns out Blake had contracted herpes gladiatorum, or "mat herpes," a highly contagious, lifelong virus that wrestlers have come down with before, either from skin-to-skin contact or from the mat itself, per the San Jose Mercury News. Now Blake has come forward to try to stop this weekend's California state championships. Health protocols were apparently not strictly carried out at the tournament where Blake believes he contracted the virus: Female wrestlers received only "cursory" skin checks and the on-site boys bathroom is said to be notoriously unsanitary. What's the difference between herpes and true love? Herpes lasts forever. Is that herpes on your head? That name is usually spelled with TWO 'T's.